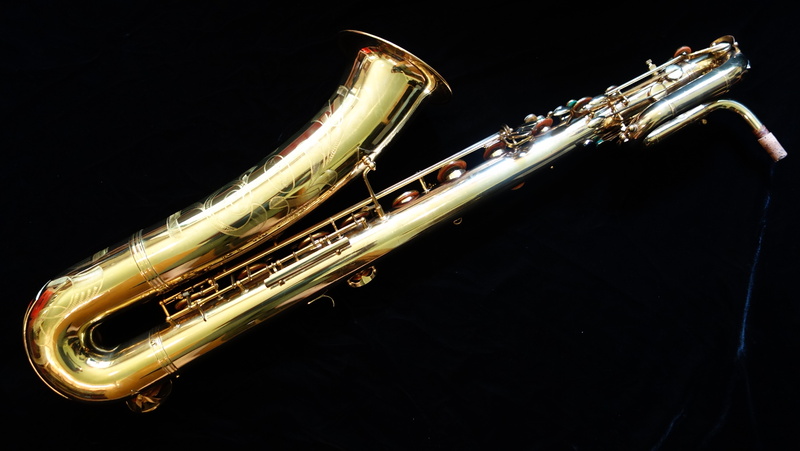 This is an excellent original condition original lacquer original pads Vito “Duke” baritone saxophone, hand made in France for Vito by Beaugnier, a small factory that made horns for Leblanc, Noblet, and Vito. 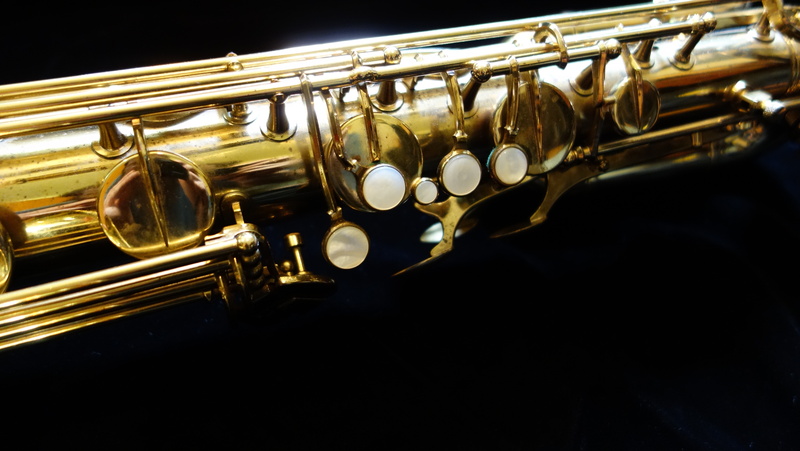 The build quality is excellent, and the saxophone plays very well. 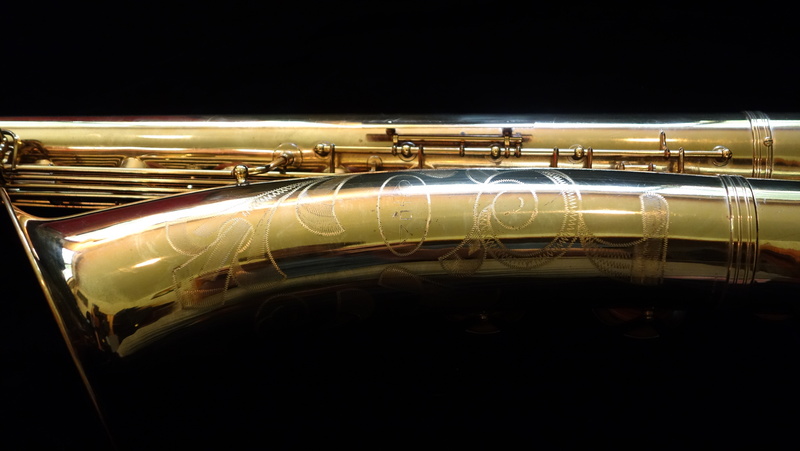 Serial number 19xxx means it was built in the early 1960s, which is the best era for Beaugnier, a firm whose quality and craftsmanship easily competes with Selmer, SML, and Buffet instruments- the other French professional saxophones of the era. 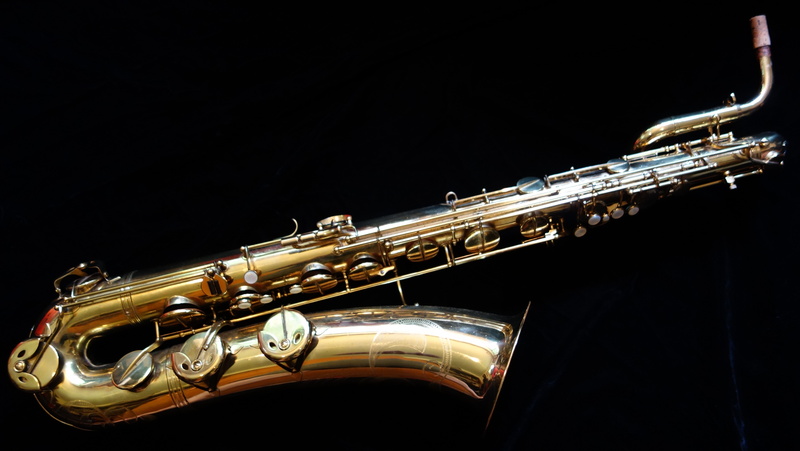 If you have been looking for a professional quality, handmade baritone saxophone that hasn’t been beat up for less than the cost of a decent used car, read on. 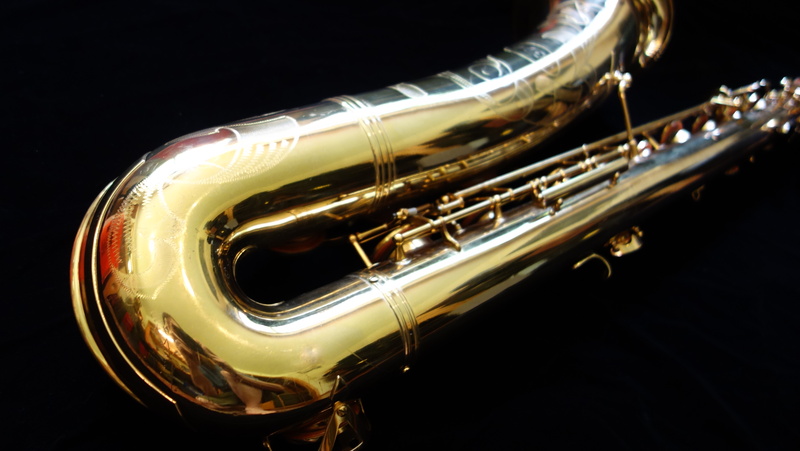 Before I realized my main love was alto, I spent a long time looking for a good, affordable baritone, and this was the horn I chose. It came to me with almost all of its original pads with the exception of two palm pads. 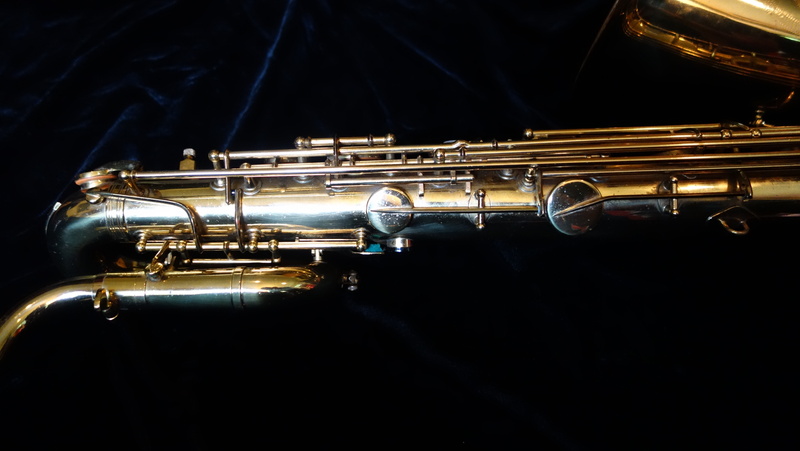 Over the year that I have owned this horn I have worked on the horn piecemeal until now it plays extremely well on all of the original pads it came with and I replaced the two non-original palm pads with pads and resonators that match the original flat metal resonators. 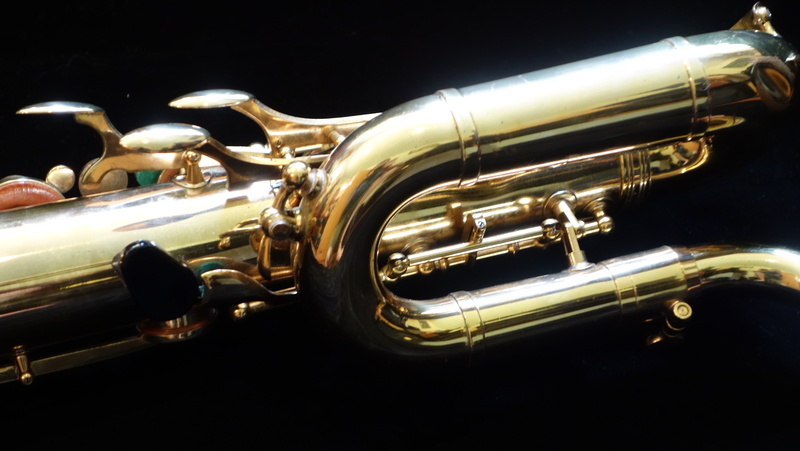 Usually I only sell horns that I have overhauled, but given that it plays so well on its original pads- which is a desirable feature for a collector- I can sell this horn either as-is or with a fresh overhaul. It comes with a Gard wheelie bag, which is very handy and protective even though it is a soft-ish case. Because of the dimensions of the case and the fact that it is not a hard shell, it will have to be shipped in a very large box with a lot of packing materials to keep it safe, so keep that in mind if you are buying from abroad. Inside the USA, shipping will probably be around $200. Outside it, easily double that, more if your country has shipping size restrictions and it has to go UPS. 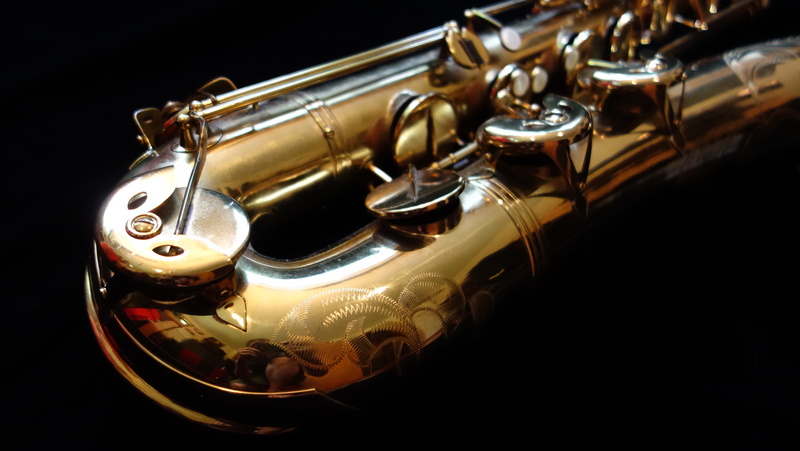 This saxophone has one flaw- a small dent on the top turn. It is in a difficult-to-access location for dentwork, so as of yet I have not attempted a fix. The top turn may need to be unsoldered to get the dent completely removed, but it could be improved and possibly (depending on how lucky I am that day) come all the way out without needing to be unsoldered. 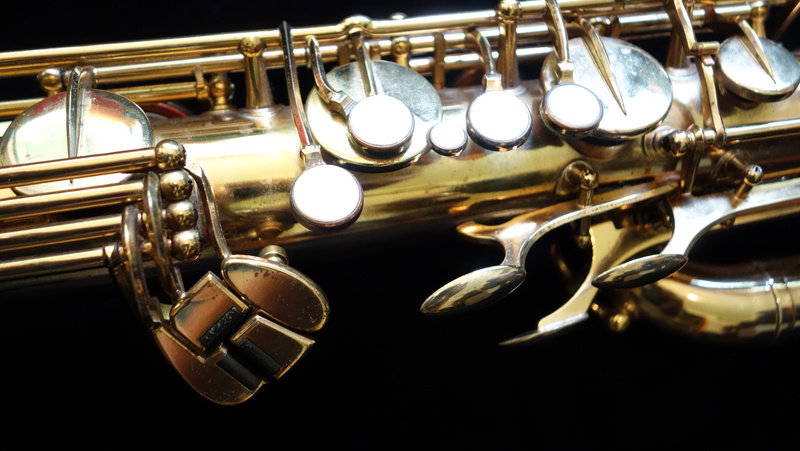 If you would like to purchase this horn, you can direct me to leave it as-is or try to remove it- either with or without unsoldering the top turn to get to it. 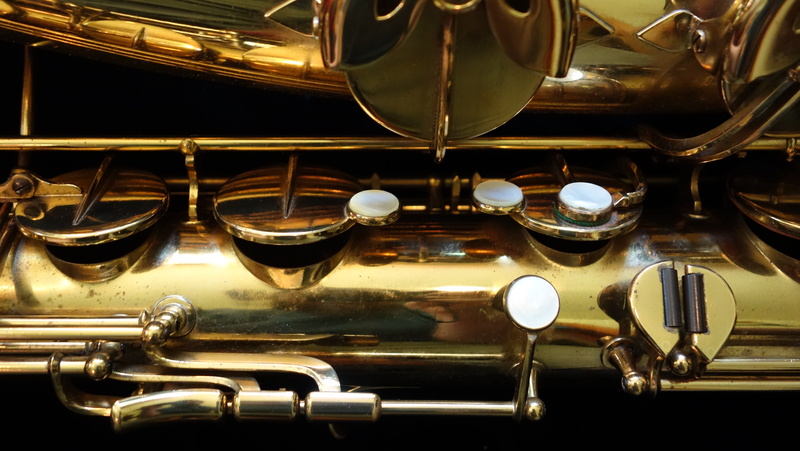 Your call, and we can talk about at length during the purchasing process. 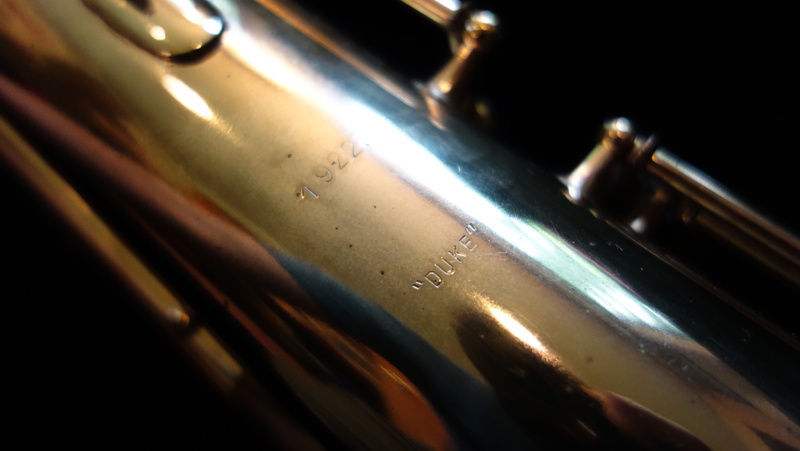 Other than the dent, the horn is in extremely good shape for any saxophone, and uncommonly, almost bizarrely good shape for a baritone. 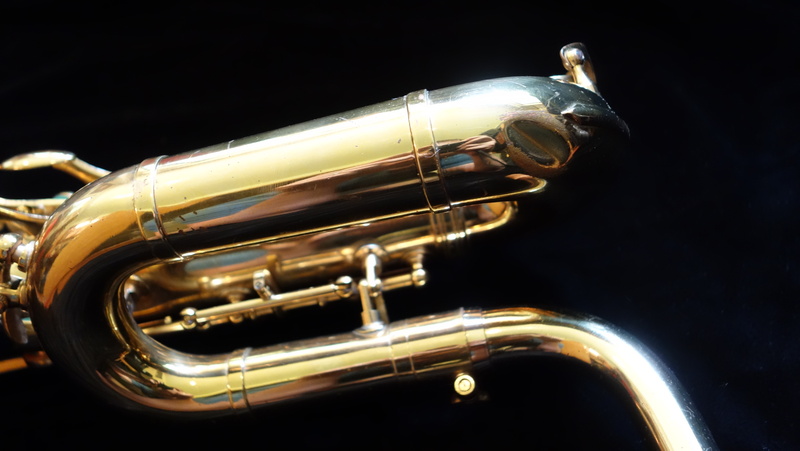 Playingwise, the horn speaks very easily and has a woody, rich tone. 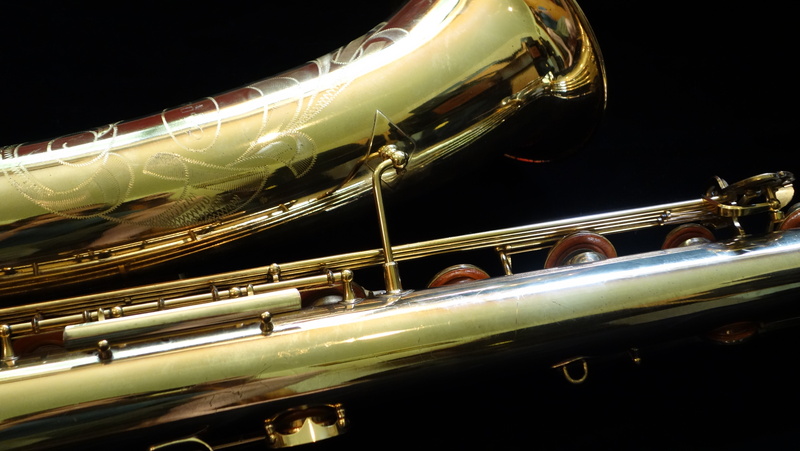 With a large chamber piece it could be a cello-like classical horn, or with a Berg or something similar it could have a Ronnie Cuber-like buzzy and punchy tone. Ergonomics are very good, with the only non-standard aspect being a slightly tilted and smaller than usual left hand pinky table, which I personally find to be very comfortable. If you have huge sausage-like fingers the left hand pinky table may be too small for you, but otherwise you will probably find it extremely comfortable after taking a few hours shedding low notes to get used to the placement. 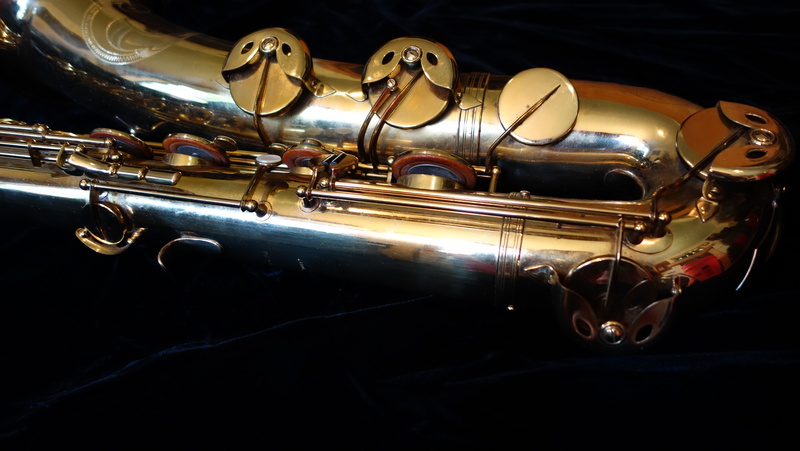 I have owned and repaired several Beaugnier-built saxophones, and I find them to be a tremendous bargain. The craftsmanship is second to none, but they are not very well known which keeps the prices down very low. 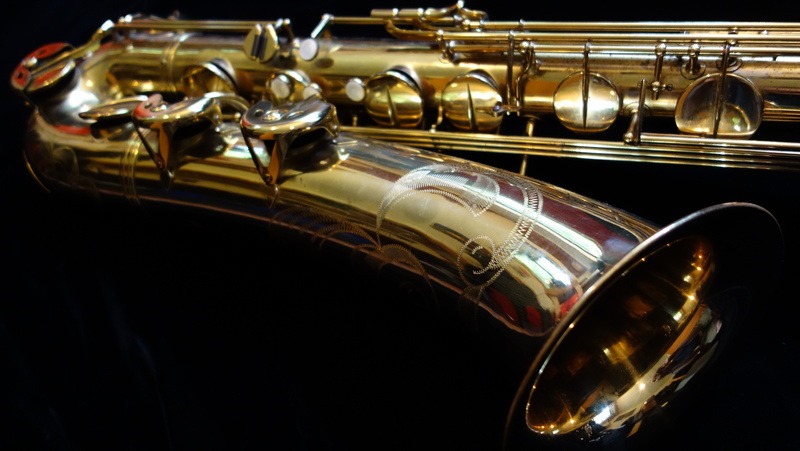 I will probably regret selling this horn eventually, but for now I am barely playing it and would prefer to re-invest in my business.